Vaillancourt Folk Art 2010 figures designed for Colonial Williamsburg. After graduation, Luke M. Vaillancourt ’05, ’06 (print media, cross disciplinary studies) had numerous job offers—including digital asset coordinator with Victoria’s Secret in New York. Instead, he decided to return home. “The area has a ton of room for growth and I wanted to be a part of that wave,” he says. Home is Sutton, a small town near Worcester, Mass. Upon his return, he went to work as a cross-media designer for Palley Advertising in Worcester. 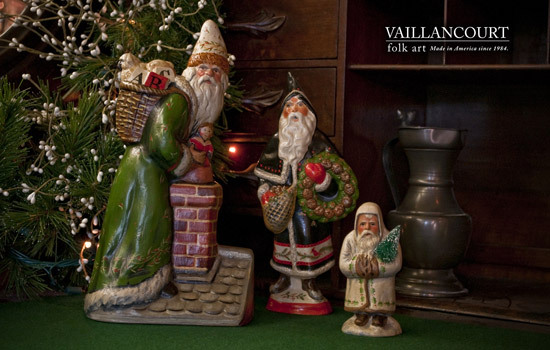 In 2007, he joined the family business, Vaillancourt Folk Art in Sutton, as director of digital marketing. The company produces hand-decorated chalkware collectibles, particularly Christmas figures, which are sold through about 500 retailers nationwide, including Macy’s, Bergdorf’s, Neiman Marcus and Colonial Williamsburg. The company traces its roots to 1984, when Luke’s dad, Gary, gave his mom, Judi, three antique chocolate molds — the beginning of a collection that now numbers around 5,000 (some from as early as 1890). Judi used the molds to create plaster figures, hand-painting the intricate details. The business took off, receiving recognition from publications such as Early American Life and Colonial Homes. Today the company is housed in a 19th-century textile mill. The site includes the studio, gallery and a museum of antique molds. A Collector’s Weekend takes place each April, when people can attend lectures and paint their own figurines. The Christmas season brings additional events. The company has a high-tech side, and that’s where Vaillancourt comes in. He manages the company’s Web presence, e-commerce and business strategies. Recent efforts in social networking are allowing the company to reach a new generation. Vaillancourt got interested in technology as a student at Worcester Academy, where he helped to establish some of the school’s first wired classrooms, dorms and computer labs. Sparked by an interest in technology and passion for design and marketing, he and his family set off to visit 15 colleges around the world to find the right program. He focused on the technical side of advertising and marketing and, as an undergraduate, he co-authored Marketing4Digital: A Guide to Print Markets with Professor Frank J. Romano. Besides his work developing the family business, Vaillancourt is actively involved in the community. In 2008, he founded WorcesterScene.com, an online resource for Worcester restaurants, bars and cultural venues; it has been described as “Yellow Pages on steroids” because of its integration of video, promotions, social media and geo-targeted information. Vaillancourt remains involved in the Worcester community, sitting on the Members Council at the Worcester Art Museum and, this year, being elected to the Board of Trustees of Worcester Academy—as one of the youngest board members in the 175-year history of the private school. He marked an even more important personal milestone this year. In October, Vaillancourt and Anna Dufault were married in Newport, R.I.
For more information, go to www.valfa.com.